Charlton are probably one of the only football clubs in the country who have played an April Fools trick on their fans with regards a new badge design !! It happened in April 2002 when a match day programme carried an article stating that the council had warned the club that the sword motif was too aggressive and asked the football club to change it. They showed 3 alternative badge designs and asked fans to phone in and vote on their favourite proposed design, the first, although not looking too controversial to most other teams fans was like a red rag to a bull for Charlton fans as it was a copy (bar the initials of course) of near rivals Fulham !! 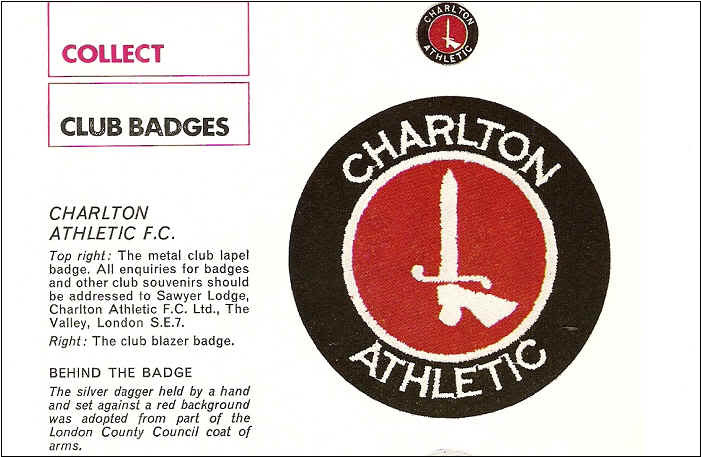 The second and third were a bit more obvious as jokes as they featured a fish (Charlton are known as the Addicks) and a strange looking bird, supposed to be a Robin, another of Charltons nicknames, apparently quite a few fans were duped by this little prank !! 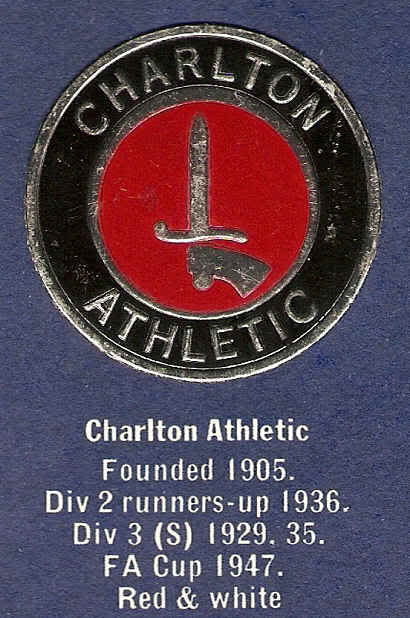 Suffice to say the badge wasn’t changed which brings us nicely back to explaining its history and as is the case with a few football clubs its difficult to get specific dates but what I can gather is an early Charlton badge featured the initials CAF in a Club, unfortunately the only image I can find is a recent enamel badge that may or may not be how it looked !! 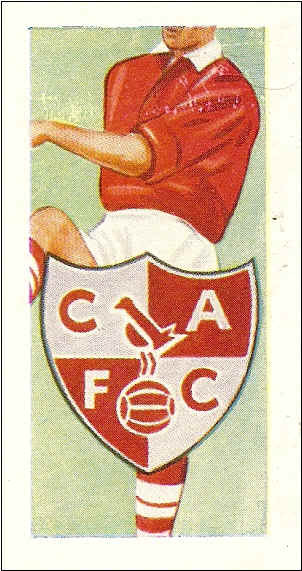 Another example of the CAFC badge can be seen on the football cigarette card below, this was issued by Kane Products in 1957. We do have these for sale on our Footybits site here. 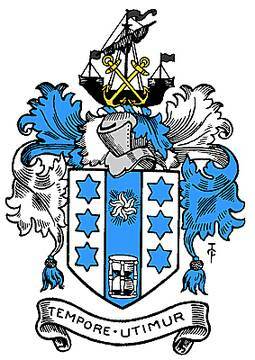 This seems to have lasted until 1964 when the club returned to using the Coat Of Arms as its official emblem, it never managed to make it onto the shirts though as in 1965 following the merger of Greenwich with Woolwich a competition was held to design a new badge, the result was the hand and sword as seen in the current badge. 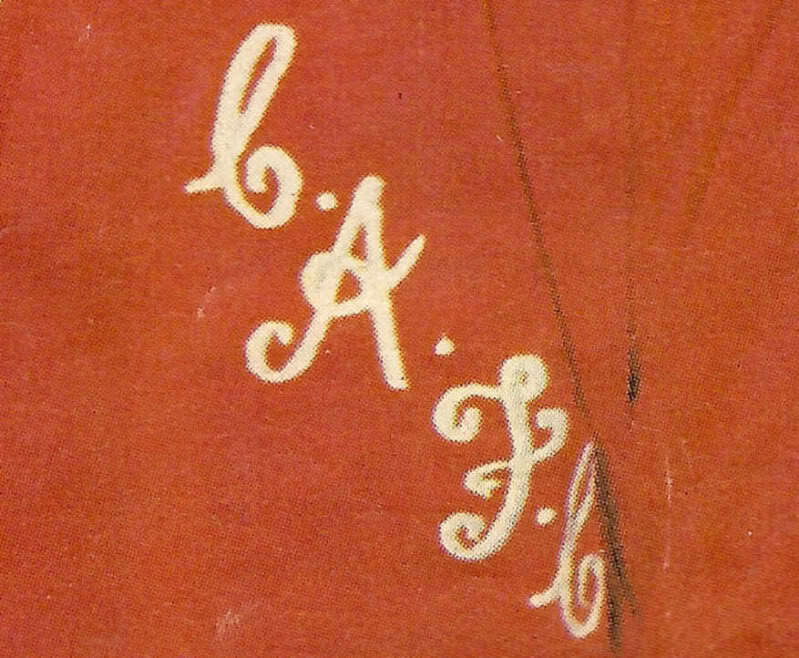 A couple of examples of this badge are shown below on some stickers issued by BAB Souvenirs. 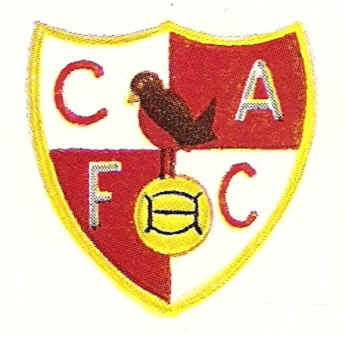 Over the next 3 or 4 years a few small changes were made to the badge, such as the addition of a circle and the club name, finally ending up with the badge as it is to this day, the earliest picture I can find of the design is from the Esso Football Badge collection issued in the early 1970s …. funnily enough I have these for sale on my own Footybits site here. Strangely enough an issue of the Football Review carried a picture of the Charlton badge in its “Collect Football Badges” series and the explanation of the badges background seems to be wrong ? Irrespective of whether the Football Review got it right there is another funny story about the sword on the new badge and that is the rumour that was set off in 1998 via a Charlton fanzine that the sword was taken from the Spencer-Percival family crest, this was later revealed as a hoax, not before it had been reported as fact in various football magazines !! So anyway, apart from a short period in the 70s when the badge wasn’t on the shirts (it was replaced with a simple CAFC as shown below) the badge is still in use and is another one of those badges that is easily recognised, even without the name around the edge !! Hopefully the above will have been of interest to you, apologies if some of the details are a bit sketchy but if Ive got anything wrong or you can add to it please feel free to drop me a mail.